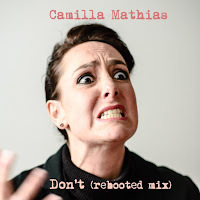 UK singer-songwriter and actress Camilla Mathias kicks off her year with a bang today with the release of Don’t, her new single and video. The long-awaited song reflects on the pains and pressures of the 21st century administrative tasks we all face each day; we can all relate to our laptop crashing, our bankcard being blocked or poor customer service. “I wanted the track to be simultaneously provocative, highly entertaining and inspiring,” explains Mathias. “I wanted it to invite us to go beyond the constraints of a screen, machine or internet connection, beyond our dependence on technology; to open ourselves up, express ourselves and communicate more fully. After only a few years in the music industry, Camilla has played live for BBC6 Music (with Chris Hawkins describing her as ‘a beautiful, captivating and delicious chanteuse’), recorded with film composer Yann McCullough (Hotel Budapest, The Hobbit), provided classical guitar for Channel Four’s Award-winning Unreported World series, and had her Romanian-Language track Sunt Romanca selected for charity compilation album Mitra for Nepal. Connecting between borders and across cultures, she has performed in French, Italian, German, Swiss German and Spanish; composed additionally in Romanian, Portuguese, Catalan, Greek, Basque and Sanskrit, and reached audiences in over twenty-two countries. Accompanying the stunning Barcelona-shot visuals of the new video are Camilla’s operatic layered vocals, poignant yet hysterical lyrics and classical guitar finger-picking. Camilla co-produced her signature sound in Switzerland with electronic sound designer Rupert Lally, and it has now been re-mixed in the UK by award-winning producer Pete Brazier at Vertical Rooms. Find more info on Camilla at camillamathias.com now.